Are you ready to master kefir and eat it every day? Most diseases begin in your digestive system, including physical and mental disease. Once you heal your gut, your digestive system will begin to work properly again and disease symptoms will begin to resolve. Kefir is a great place to start. I have had my kefir grains for years and have made kefir every day for over a decade and let me tell you – these kefir grains, which are combinations of bacteria and yeast, have a mind of their own. When I make kefir, my kefir grains will start to float to the top of the jar like they have a life jacket on. They make kefir extremely well and multiply like rabbits, and they demand that I pay attention to them. If I get too many in a jar and don’t add enough milk, when I open my jar they will spit and bubble at me as if to say, “Add more milk please!” My grains are intense and I like them that way. They have over 50 strains of good bacteria, and I don’t know of any other food that can give you so many good bacteria in such a small amount of food. Kefir grains will last forever if you take care of them. Why is my kefir not getting thick? Nine times out of ten it is because it has over fermented and people don’t realize it. Kefir grains are extremely active and strong and will multiply quickly, and before you know it the grains will need more milk. They’ll start fermenting so fast you will think that your kefir is not done because it’s thin, when the opposite is happening. If the grains have increased and you have not added enough milk, they will ferment the milk faster and you might not notice that the kefir is ready and thick. 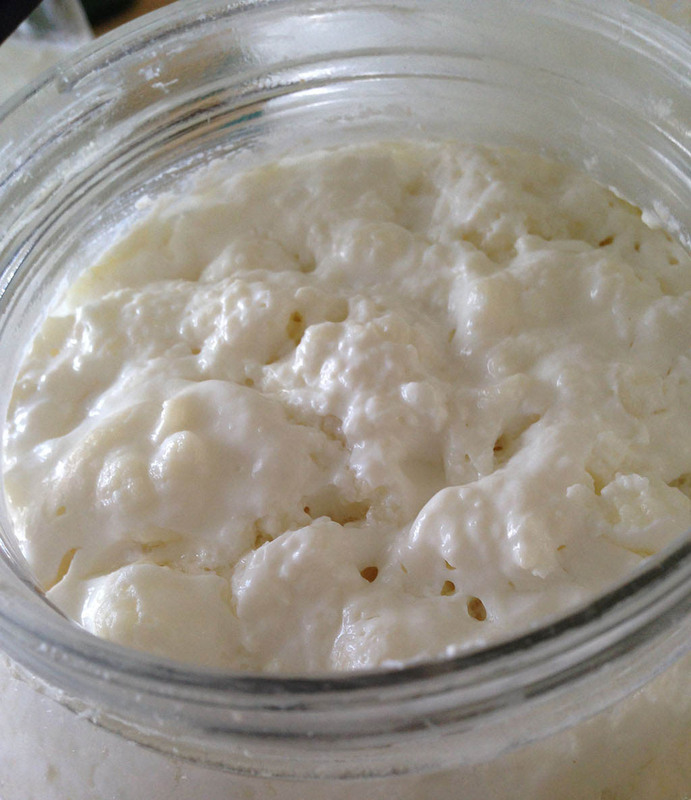 Then as it sits longer, the kefir will start to separate into whey and curds. It can create quite a panic for people and they fear they have done something wrong. 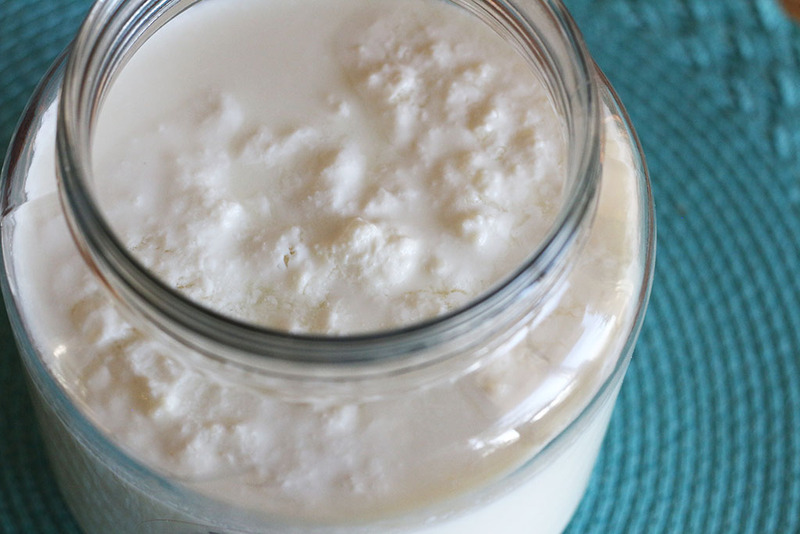 Many will throw this over-fermented kefir out. Don’t do that, it’s still good! First, let me say it is never ruined, it is just really fermented and sour. One of two things has happened. First, you may have too many grains for the amount of milk you are using and need to add more milk or remove some of the grains. Or secondly, your house is warmer and it is fermenting faster and, again, you will need to add more milk. If you see clear yellowish liquid and curds, it is over fermented and has passed the thickening stage and is now separating into whey and curds. Again, this is not bad – it’s just a little more sour and may be less appealing. 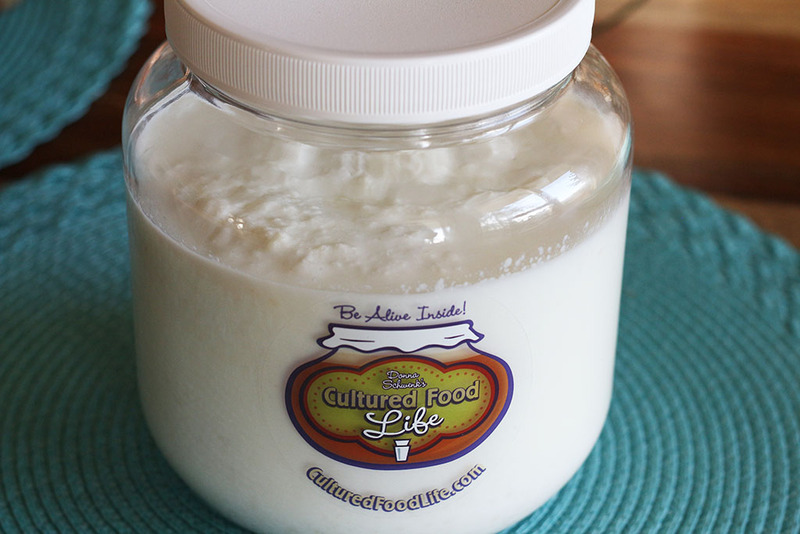 You can separate the grains from the kefir and then mix up the kefir by stirring or shaking the jar. You can then drink it, make a smoothie, or store it in the fridge. If it is overly sour, you can add some fresh or frozen fruit to it and let it sit for a couple of hours on your counter. The bacteria will eat some of the sugar in your fruit and make the kefir taste milder and increase the nutrients. For more info, you can look at my second fermenting page. Trouble separating the grains from the kefir? Pour the whey from the bottom over the kefir to help it separate. Sometimes it is hard to separate the grains from the kefir when it gets like this. 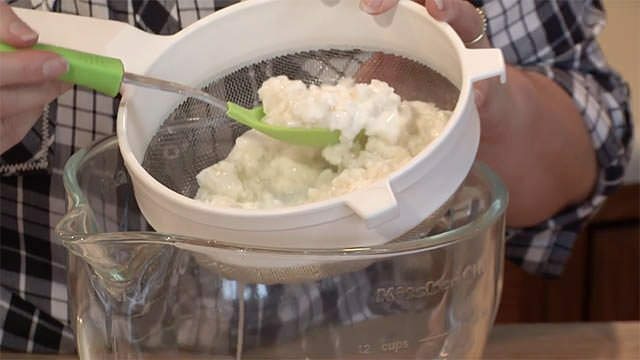 The best way to do this is to put it in a strainer and as the whey goes to the bottom of the bowl, take some of the whey out of the bowl and pour the whey back in over the clump of kefir, stirring with a rubber spatula until it thins it out and goes through the strainer. You may have to do this several times until it goes through the strainer. Something is wrong with your grains. Your house is colder and it needs to ferment longer. The big test is the taste test. If it is getting tart and sour, your kefir is working. It should also thicken, but you will need to watch it to make sure it doesn’t over ferment. Always use cold milk straight from the fridge and don’t use a heating pad unless your house is really cold and in the mid to lower 60s all the time. Kefir grains that are strong will make thick, tart kefir and you will love it. I hope this will help you make good kefir and take away some of the confusion. 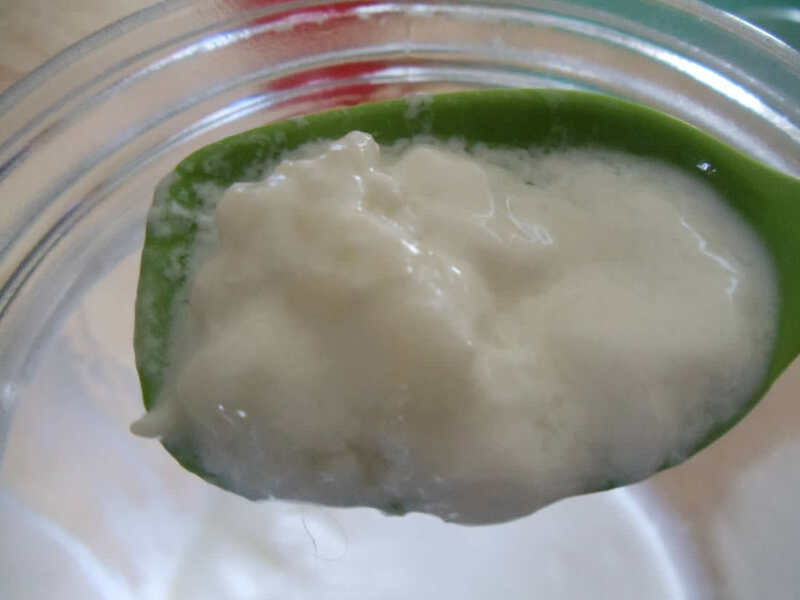 Watch your kefir in those first few weeks and you will learn so much as they make kefir for you. They’re alive with the very same bacteria that resides in you, and you might as well watch and observe how they eat all the milk sugars (lactose) out of your milk and make probiotics from it. Is that not the coolest thing ever? They eat the sugars and make it tart and then you have a creamy drink that is 1% sugar and loaded with nutrients and 50+ probiotics. What else on the planet can do this, and has been around since time began and wants to hang out with you in your kitchen? Give it a jar and a lid and watch it do its thing. 427 Responses to "The Thick and Thin of Kefir"
I thought I had posted this question before, but can’t find it anywhere. Forgive me if it’s a repeat! I’m excitedly awaiting my shipment of your kefir grains and was wondering…in addition to selling and giving away your excess kefir grains, do you ever eat them? I’ve read that several people online have stated they consume them and that they are tasty. Wondering what your experience has been…taste, texture, preparation, possible effects to the body. Yes you can eat them and blend them up in a smoothie is a great way and good for you! Hello:) I was just given some Kefir grains by a friend and have already finished making my first batch. So excited to start on this road! But I was wonder if at some point I’m going to have to start fresh with new Kefir grains. Does it ever get to a point where it can’t be used any longer? They last forever if you take care of them. I’ve had mine for over a decade. Hi! Great site. I have been trying to master milk kefir for a few weeks without success. My biggest issue is every batch always has a very very strong yeast taste to it. Is this normal? Any suggestions? It also separates very quick even though my home isn’t very warm (66 deg) and has never thickened up. Are you using raw milk with cream? 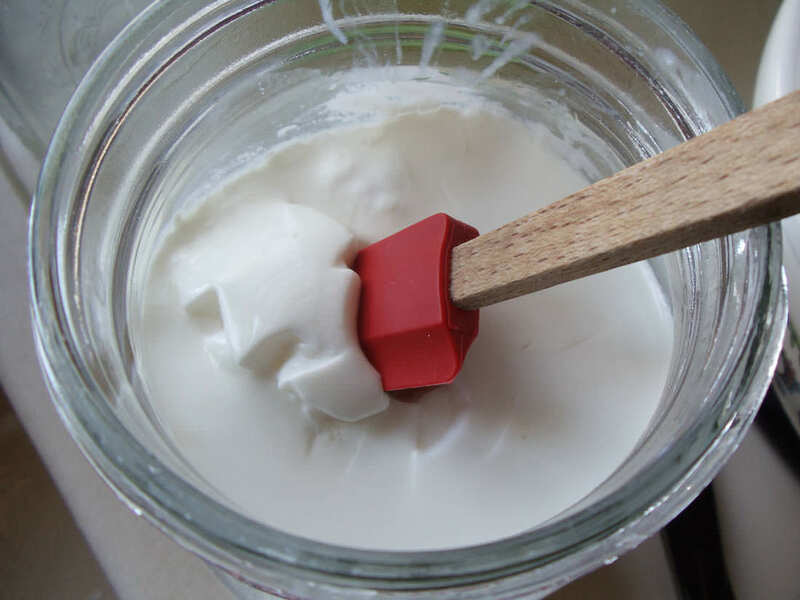 This can have a really yeasty taste so I always remove the cream before making kefir. Regular pasteurized milk actually works very well and the process of fermentation removes and breaks down things that are unhealthy in the milk and also inside of you. Plus loading it with vitamin C an B Vitamins and probiotics. I was given a kefir grain from a friend a few days ago. I rinsed it in cold water and I tried making it it over night but when I checked it in the morning it still looks watery. Just like milk and it doesn’t smell like yogurt at all. The grain is large, about an inch and a half and I put it in a quart of milk. Please help, I don’t know what I did wrong!! Oh no!! I want to cry. I dumped out half of the milk but I guess I’ll try some fresh milk and see what happens. I wish I would’ve read that blog before I rinsed it. Thanks for the response! Ok…I think my grains have survived!!! After fermenting for 24 hours the milk is thick with some chunks and whey but not as much as your picture. My question now is how different are the grains from the starter culture? I’ve done the culture before and after fermenting it smells like yogurt. This smells more sour, even more so than the cultures I’ve left out for 48hrs. I’ve tasted it and it doesn’t taste the same either. I got milk kefir grains from a friend 2 1/2 months ago and have been making good kefir. It seemed to get thicker and creamy lately. Today, though, after 24 hours it had separated into curds and whey and the grains seem to have almost disintegrated! Will my grains come back to normal? What did I do wrong? Have you been putting the grains in the fridge a lot? I have heard of people who have not been feeding them a lot and keeping the in the fridge have had this happen. I have several questions about kefir , i hope you can answer it. 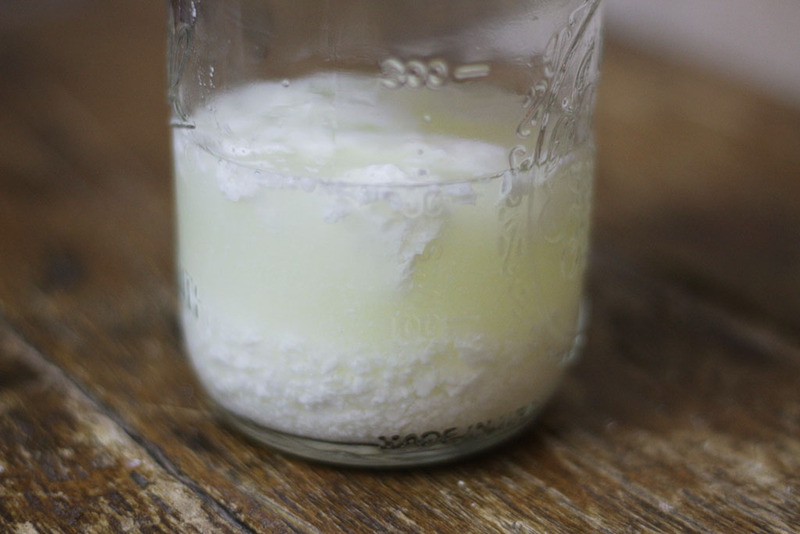 1. is it okay to use dry milk powder for making kefir ? 2. what is the best treatment for kefir grain if i just make kefir once a week ? 3. why UHT milk is not recommended for making kefir ? because i tried it and it is fine for me . 1. You can use powdered milk although it isn’t as thick and creamy as regular milk. 2.Keep them in several cups of milk making sure its at least 1 tablespoon of grains to one cup of milk and more milk is better. 3.If its working for you then great but most have a lot of problems with UHT milk. I have just thrown out my second attempt to make kefir using homemade almond milk. In my attempt to follow directions, I left it overnight on my counter. In the morning the whey had separated from the curds. Would it be possible for the kefir to develop within two to four hours? Last night I could see that something was happening. Maybe I should have refrigerated it then. I hate tossing the kefir grains! Or maybe I have powder. They looked like paste. Another thing, I am the only one who eats it. I only need one cup at a time. Does the amount of grains/powder lessen for one cup of milk? Which are you using the powder or the grains? They must be powder–Kefir starter by Body Ecology. I did not see any grains. What type of milk should I use to get the thickest kefir? Donna, I have a question about the milk protein, casein. I have read where casein isn’t good for you. So, I’m concerned about the mount of kefir I am drinking (1/2 cup twice daily) and wanting to know if ultimately the amount of casein I’m drinking in the kefir is healthy for me. And, I only make kefir with raw organic milk….so, it is unpasteurized. Does making the kefir with raw organic milk make a difference in our bodies being able to process the casein? Thank you I advance for your reply. I’m having a little trouble with my grains, and was wondering if you might have some advice to share. I dehydrated my live grains at a very low temperature in an electric dehydrator because I was going away for several months. Now I’m having trouble getting them going again. I’ve been giving them milk for about two and a half weeks. It’s slowly getting closer to kefir, but nothing like the thick, fizzy, sour drink they were producing before. It thickens, but doesn’t really get sour to speak of. Have I permanently damaged them, or is there something else I can do to revive them? My kefir is very fizzy but not thick. I want it to be thick. It has nice clean sour taste. This is the fifth time I have made it. The previous times it got away on me and turned to curds and whey. What are the stages of fermentation? Does it get fizzy, then thicken and then curds/whey? I don’t know if I should leave it longer so that it will get thick. I’m afraid that if I leave it longer it will turn to curds and whey again. I never noticed it this fizzy before but I was leaving it over night and missed the stages. Thank you so much for your wealth of knowledge! I’m just starting out on our fermented food journey. I’ve been making kefir for a few weeks now. My first batch turned quickly to curds and whey and since then I keep it right next to my sink and watch it closely! I’m in Sydney, Australia and it’s warm.. the kefir only takes 5-6 hours to develop its first pockets of whey then I strain it. This is pretty quick, and I know I could increase the milk or reduce the grains… but this timeframe is actually very convenient for me. I start at breakfast and finish around the end of the school day. Just wondering though – are we still getting the full benefits of the kefir? Or would we be better off making adjustments so that the process takes around 24 hours? I don’t think it will ever need a full 48 hours here. This is perfect and don’t change a thing! I am getting kefir at a 12 hour rater as opposed to 24. Should I separate the grains into two jars. I’m thinking they are too powerful at this point and there should be less of them in the qt. size jar. Yes you can do this and experiment to see what works the best. Hi there, I had some grains that were making delicious creamy kefir and then I accidentally let them separate once or twice, and now my kefir is not the same it stopped thickening and it will still separate but it has lost its tartness and thickness, and the grains have lost their “sliminess” , any suggestions on how to remedy this? They have been like this for almost a couple of weeks now and I’m afraid they will not go back to how they were. And I’m thinking I might have to just start over with new grains. Have you experienced this? No I have not experienced this but if it isn’t souring your kefir than its not making kefir. What do you do when your kefir become very creamy and bland (lost it’s tartness) Has it lost it’s qualities? Thanks Donna for your reply. It could mean this if anything it should be more sour. What kind of starter did you use? I’ve been making / drinking kefir for around a month now and i’ve seen some benefits but its making me quite constipated. I did once let it ferment too long and it became yoghurty but since then i’ve been stopping it while its still a thick liquid, but it has the same effect…. what am i doing wrong please? Could i be drinking too much? (around 3/4 of a pint per day). Often I have found that constipation is because the body is detoxing and things are exiting through the colon. Cultured veggies can help with this as should extra magnesium. Thank you very much for your reply, any help right now is greatly appreciated! I already eat nuts and seeds which I believe are high in magnesium. Should I consider supplementing with magnesium tablets (if there is such a thing?). I’ve also started on ground flaxseed to help with this problem – no joy yet. I’m a little concerned that I actually felt great before starting the kefir but since starting I haven’t been able to stabilise my digestion and have been feeling bloated & constipated despite decreasing my consumption to around one small glass 3 days a week. Admittedly I went overboard to begin with and was drinking pints of the stuff daily (love the taste). I started the Kefir because I have very mild psoriasis (just a few spots on my elbows and fingers) and thought it might make a difference, and all the information on it sounded quite amazing. Are there just some people that are not suited to kefir? i take magnesium pills 500 mg. recommended by dr. she said i could one at night, one next day. when things become way too loose, u can back off. but you will figure out what’s a good amount. its been very helpful. I’ve been making kefir for a few weeks. My grains appear to be growing. One of them is much bigger and seems like a lot of small grains clumped/grown together. I’m assuming this is normal? but wondering if I can separate them into smaller clumps or will this damage them? You can separate them and it won’t hurt them. I’ve had my grains for about 2 weeks and they were small when I got them. I’ve been making kefir every 24 hours and the milk thickens beautifully but I have a hard time finding my grains. I wondered if it takes a while for them to grow? I’ve just been leaving about 1/4 cup of the kefir in the jar and adding milk to this. Is this ok? Are you kefir grains dehydrated? These type don’t grow very well but the live grains do. Hi. I have been making kefir with powered starter but want to switch to grains for the additional bacteria. However, I can’t always find organic non Ultra Pasturized milk. I know the non Ultra P milk is ideal but wondering when I can’t find it if Ultra P organic can work. I hesitate to invest in grains if I will kill them with Ultra P milk. The ultra pasteurized will not work well with grains and I have seen it kill them so I would use regular pasteurized milk instead and kefir will make this a good product and was what I used in the very beginning when i first got started with kefir and had many benefits form this. Can I use the purchased sweetened coconut milk(Silk) fo the milk kefer? I’ve been making kefir with my grains for over 3 years and they’ve been doing great. We love kefir. Just last week, my kefir started not thickening. The first time it did this, I put the milk back in with the grains and let it sit overnight. By morning, it had separated into curds & whey but still wasn’t thick. I let the next batch sit for 2 days and it had separated again but still not thick. I started a new batch yesterday, now at almost 24 hours it hasn’t thickened. It tastes like kefir but isn’t thick like it’s always been for me. Any suggestions on what’s happening? I just received my kefir grains a couple of days ago. I made kefir yesterday, but it smelled like spoiled milk. I read that sometimes due to the stress of shipping it can take up to a week for the grains to start working. How can I tell when it’s kefir or just spoiled milk? It will be sour or tart and can be extremely so if it ferments long enough. It shouldn’t taste rotten it should taste very sour and sour is what will let you know if it is good or not. It however can be very sour at times depending on how long it culture and the amount of grains to milk. I am new to kefir and I love it! Every nightI feed my grains and second ferment the previous day’s kefir. I have noticed the last two days that my second ferment is already separating by morning. How do I handle this? Today I just put it right into the fridge but I want to make sure I am handling it right. I am trying to get to the point where I always have enough for my large family of second ferment and then enough kefir to strain out the whey to use in fermenting veggies. Thanks! You can only second ferment it for an hour or two or even in the fridge if you would like. This way it won’t separate and will taste good too. I like the site. I’ve found some really good information. Thank you!